A screen grab of the video. 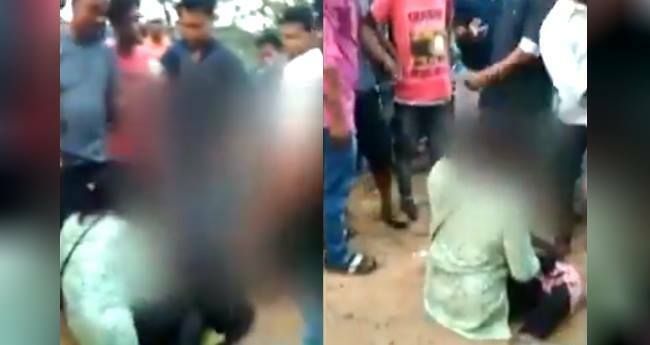 In another shocking case of moral policing, a woman was mercilessly beaten up in full public view by a group of men in Meghalaya’s West Garo Hills district. The incident came to light after a disturbing video of thrashing a woman surfaced on social media. The video shows a woman in a greenkurtais trying desperately to shield herself from punches and kicks from a group of men who stood in a circle around her. One of them, his sleeves rolled up, pulls her hair from behind and then kicks her in the groin as he shouts something at her. Then another man punches her on the face. Based on the video, Meghalaya police have arrested a man for assaulting the woman. Police said he assaulted the woman as punishment for her alleged relationship with a person from a different community. The arrested man has been identified Biren Sangma, a resident of West Garo Hills. “It is a clear case of moral policing. The woman is safe and is being counselled after she went through the ordeal,” a police officer said. A person who saw the assault said some people kept on watching as the woman was being thrashed. “She was thrown on the ground before she was kicked in the stomach, legs and hands,” NDTV quoted a local as saying. This is the second such incident reported within a week since April 8, when the police in Assam’s Goalpara district arrested 12 men for assaulting a Garo woman at Paikan on the Assam-Meghalaya border. The girl was bashed up after she was spotted with her friend at Aolaguri area under Krishnai police station. The woman and her friend were apparently going to a medical centre when the beating incident took place. The attackers sought an explanation from the woman for going out with another man, he said, adding that the victim and her assaulters belong to theGaro community. A video of the assault has gone viral on the social media, in which the group of men were seen hitting the woman on her face, pulling her hair and kicking her.